Gemini Cut Glass is one of the top chandelier makers in the United States, and has been in business since 1956. We design, manufacture, and restore fine lighting, and provide a wide array of services to designers and the general public. Our specialties are the design and creation of custom chandeliers using new and antique parts, and the restoration of antique chandeliers. CHANDELIER MAKING: We can make copies of chandeliers from the English Periods and the French Periods such as Georgian, Chippendale, Victorian, Edwardian, Waterford, Louis XII, Empire, Louis Philippe, Regency, Baccarat, etc. Each and every chandelier is painstakingly custom built, balanced, checked, and inspected at every step. We take pride in the fact that we are among the very few chandelier makers who have an inventory of antique pieces, chandeliers, and crystals. Many of our crystal parts date back to 1938 and beyond. Apart from chandelier making, we do almost all kinds of restorations for chandeliers, and have a huge inventory of crystal prisms, jewels, balls, spears, crowns, arms, canopies, etc. Our technicians are trained to handle installations and restorations with kid gloves. We have decades of experience converting candle chandeliers into electric chandeliers, and vice versa. We are licensed UL converters, and all European chandeliers, lamps, and fixtures can be changed to the American system at our facility. 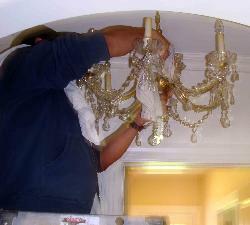 We provide on-site chandelier cleaning services. All cleaning is done by hand, the old-fashioned method, and we do not leave a client's place until we are sure they are satisfied. More information on Cleaning is available. Our crystals are of the finest quality, and we use hand-faceted Austrian rose jewels and tear drops; we also carry exlusive designer crystals. All our crystals are imported directly from Europe. We can also provide custom-built crystal pieces and arms for restorations. We have a state-of-the-art factory, which includes a glass-finishing unit. There is an on-site Showroom, which can be visited by appointment. Our customer base is extremely strong. It includes The Russian Tea Room and Tavern on the Green in New York City, the Trump Organization, Victoria's Secret, Christie's, Manhattan's City Hall, and many others. Our chandeliers can be seen at Trump Taj Mahal, and at most of the new Victoria's Secret showrooms across the nation. More information is available on the About Us page. Our company is renowned within the lighting industry, with a distinguished reputation among interior decorators, designers, and corporations.